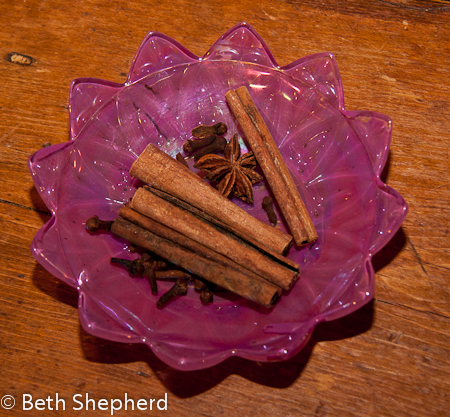 How is it possible that I haven’t yet posted the recipe for Big Papa’s favorite homemade ice cream: Cinnamon-Clove? In my admittedly biased opinion, these two spices are quintessentially winter. That’s why Cinnamon-Clove Ice Cream is THE ice cream to make over the holiday season. On Sunday, we brought Cinnamon-Clove Ice Cream to accompany the delicious mincemeat pie our friends made for the Christmas dinner they hosted. You could also pair this ice cream alongside fresh apple or pumpkin pie, gingerbread, a pear tart or simply enjoy it on its own. Whenever I make a batch, I always let Big Papa act as my taste tester. Inevitably, he says the same thing each time—albeit with a sly smile on his face: “It’s terrible. Don’t serve it to our guests. I’ll have to eat it myself.” Of course as long as I’m the chef in the house he’s out of luck, because he’s going to have to share it with me! Combine milk, cream, 1/2 cup sugar, cinnamon and cloves in heavy medium saucepan. Bring to boil over medium-high heat, stirring until sugar dissolves. Remove from heat. Cover and steep 1 hour (sometimes I let it steep a bit longer for more intense flavor). Whisk yolks and 1/2 cup sugar in bowl until well blended. Bring milk mixture to simmer. Gradually whisk hot milk mixture into yolk mixture; return to same pan. Stir over medium-low heat until custard thickens and leaves path on back of spoon when finger is drawn across (do not boil). Strain into another medium bowl; chill uncovered until cold, stirring occasionally, about 2 hours. Note: After I strain the custard, I like to wash off the “spent” spices, air dry them and then toss them into a jar and cover them with sugar. After a couple weeks, the spices flavor the sugar which I use to add a warm kick to espresso, homemade hot cocoa and other recipes. Process chilled custard in ice cream maker according to manufacturer’s instructions. Transfer ice cream to container; cover and freeze. The ice cream can be prepared 3 days ahead. Keep frozen. Want to spice up your life with more deliciousness? Check out Wanderfood Wednesday!